Boy it’s miserable out this morning. Here in Barnegat, NJ, we are having another Nor’Easter. Right now at 8:13 a.m., the temperature is hovering at the freezing point. Noisy window rapping, icy rain pellets have begun to change over to big quiet snow flakes. From my chair by the fire place, I have a direct but partial view of what’s going on outside our front door. “You’re looking at it,” I said. Yep, I’m pretty much ensconced in my chair for the duration. 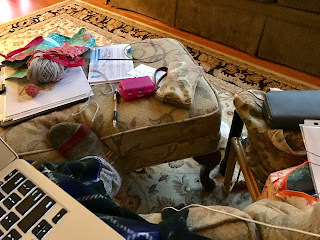 While sipping on a never ending cup of herbal tea, knitting, blogging, watching YouTube videos and staring out the window are on my agenda today. By the way, here in Barnegat, NJ, yesterday the temperatures were in the 60’s. 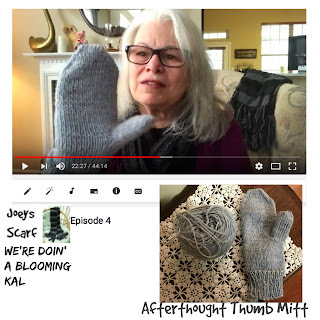 For my knitting and crocheting friends, I have started a knitting podcast called Joey’s Scarf. I would love for you to check it out. I share what I’m currently working on, what I’ve made and show you any new and yummy items I’ve added to my stash. Just as important to me, though, is the segment I have near the end of the podcast where I share memories of my Joe. It’s interesting, you know, in the past few weeks I have been doing these podcasts, I have found being able to talk about Joe out loud has fulfilled a need in me that I didn’t realize I was missing. It has been so comforting. I think I was beginning to feel that somehow Joe was getting further and further away from me. Everyone who has suffered the loss of a loved one surely understands the feeling, right?